Three major players — CanWest Global Communications, CHUM Ltd. and Alliance Atlantis Communications — are gone, while others scrambled to pick up the spoils and adjust to life in the wireless-online world, some more successfully than others. Those changes, however, did not translate into a more diverse and balanced media system. If anything, Canadian news coverage and commentary is more conservative than it was five years ago, and just as concentrated, as the Harper government ignored every recommendation the committee made. True, alternative media have made great strides to provide more balanced coverage of major issues in the intervening years, but a great gap still persists between advertising-financed journalism and everything else. The biggest story over the period was CanWest Global Communications’ implosion and the demise of the Asper family as pre-eminent press barons. When the Senate committee visited Vancouver in 2005, CanWest was Canada’s largest media company, controlling nearly 30 per cent of total Canadian daily newspaper circulation and 90 per cent in Vancouver, with the Vancouver Sun, The Province and National Post, plus a chain of community newspapers. CanWest also owned Global TV, which held a 70 per cent viewing share of the all-important 5-7 p.m. supper newscast slot. Vancouver was one of the most highly concentrated media markets in the world. With a few exceptions, the Aspers controlled what Vancouverites watched and read. And even in radio, CanWest seemed to have an informal agreement with the leading private radio station, the Corus-owned CKNW, to share personnel. In hindsight, the company was perhaps doomed to fail from the outset, when family patriarch Izzy Asper was snookered by Conrad Black into paying too much — $3.5 billion — for Black’s chain of newspapers and his vanity publication the National Post. That ill-advised purchase saddled the company with a heavy debt load that son Leonard proved incapable of reducing. When the recession hit in 2008 and advertising tanked, CanWest filed for bankruptcy protection. That leaves Canada’s commercial news media in the hands of a Gang of Seven: the billion-dollar corporations that control what Canadians read, watch and hear about the world’s daily happenings. Many of the chief executives are members of the Canadian Council of Chief Executives, promoting its agenda of business-friendly policies. Quebecor: Brothers Pierre Karl and Erik Peladeau squeak onto the Rich 100 List in 99th place, with a net worth of $610 million based on their majority ownership of Quebecor stock. Originally a publishing company, Quebecor became a national media company with the 1999 purchase of the conservative Sun Media newspapers and, in 2007, the Osprey chain of 19 smaller Ontario dailies and a stable of weeklies. Those acquisitions make Quebecor the second-largest newspaper owner in Canada, with 23 per cent of paid daily and weekly circulation. It also dominates in Quebec, with ownership of cable giant Videotron and French-language television network TVA. Quebecor also owns canoe.ca, the third-largest news media portal (31st most visited site), behind sympatico.ca and cbc.ca. But Canadians would know little about the family if it hadn’t become an unabashed leader of the class war being waged by the 0.1 per cent against the 99 per cent. True, there is the evidence of the overwhelmingly conservative stable of columnists writing for Sun papers. But what brings the company to national attention is the Sun TV venture, with its lame attempt to model its reporting and commentary on the dynamic Fox News formula. Perhaps to boost viewership, Peladeau and his barking dogs declared all-out war on the CBC, seeming to coordinate their efforts with the Harper government. Bell Media: During the 1980s, Bell was the nation’s largest telephone operator. That’s when it realized that higher profits would one day be earned from the information carried over phone lines — now called content — than from the tightly regulated telephone system — carriage. Many failed attempts later, BCE — Bell’s parent company — finally thought it hit pay dirt when it gained majority ownership of CTV television network, whose news, entertainment and information programming could be transmitted over its wireless network. Bell is a rarity in Canadian media, a company not owned by a wealthy family. Instead it is operated by management, overseen by a board of directors top-heavy with connections to banking and finance industries. It would provide a worthy target for an Occupy Bay Street action. Bell’s impact on news is substantial through the 28 stations of the CTV television Network, CTV News Channel, Business News Network and sympatico.ca, the top Canadian-owned news portal (10th most visited site). Bell also owns the Comedy Network, Canadian home of John Stewart’s The Daily Show, where many people say they get their news. Unfortunately Stewart is all-American except for a hilarious segment on the town of Asbestos, Quebec, and Canada’s asbestos exports. Shaw and Corus: Calgary’s Shaw family emerged victorious in winning control of Global TV and CanWest’s specialty channels, making it a member in good standing of the Gang of Seven. Along with 30 specialty channels, the Shaw family, led by patriarch J.R. Shaw — net worth $1.4 billion — control two key news sources: the 16 stations of Global TV and the 41 radio stations of the Corus Radio Network. This network does contain the centrist Vancouver-based CKNW, but tilts far right with its stable of conservative talk show hosts such as Charles Adler and Roy Green. Postmedia Network: When the Senate committee issued its report, this company didn’t exist. Today, as owner of the National Post and Canada’s major metropolitan dailies, and controlling 31 percent of Canadian paid daily circulation, Postmedia has enormous influence on public opinion. Yet it may not even be a Canadian-controlled company, in defiance of Sec. 19 of the Income Tax Act. This provision allows advertisers to deduct their costs of advertising in Canadian newspapers as a business expense only when the paper is 75 per cent owned by Canadians. Since newspapers obtain about 80 per cent of their revenues from advertising, this requirement effectively kills foreign control of Canadian newspapers. Postmedia Network was assembled by Paul Godfrey, whose conservative bona fides are evident from his stint as publisher of the National Post and as former head of Sun Media, which he sold to Peladeau in 1999. Godfrey brought together the companies that had invested in CanWest’s bonds when the company was tanking. These companies are known as vulture funds because they look for troubled media companies like CanWest and then swoop in and scoop up company debt at a depressed price. That’s why Postmedia was able to get the CanWest papers for less than a third of what Asper paid 10 years earlier. The investor group is led by GoldenTree Asset Management of New York. Other non-Canadian shareholders include Alden Global Distressed Opportunities Master Fund, Bank of New York Mellon and First Eagle Investment Management. To get around the pesky Income Tax Act requirement, Postmedia created two classes of shares — voting shares that have no ownership position, and non-voting shares that own the company. Or something like that. Only a tax lawyer can know for sure. But whatever the details, the Canadian Revenue Agency seems satisfied. Vulture funds are not patient long-term investors. They want in and out fast, usually expecting to exit with profits in the 30 per cent range. Perhaps Godfrey is preparing for that day, cutting expenses by eliminating 500 full-time jobs and jettisoning media properties — Victoria Times Colonist, Lower Mainland community papers — that do not fit in with the strategy of driving readers to the Internet and monetizing their attention. Rogers Media: Rogers is another major media conglomerate looking for ways to marry its content — Rogers Sportsnet, Maclean’s, Canadian Business, 55 radio stations — to its wireless network, Canada’s largest. The family is Canada’s 4th wealthiest, with a 2011 net worth of $5.9 billion. Ted Rogers bought his magazines in the mid-90s, but waited a decade before moving his flagship Maclean’s publication firmly to the right. 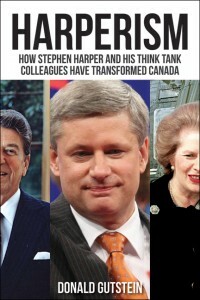 Maclean’s prominent conservatives include publisher Ken Whyte and national affairs editor Andrew Coyne, both of whom are on the board of Peter Munk’s Aurea Foundation. Every year this charity pumps hundreds of thousands of dollars into the coffers of the C.D. Howe Institute, Canadian Constitution Foundation, Macdonald Laurier Institute and Fraser Institute. These think tanks work covertly with the Harper government to shift the climate of ideas firmly to the right. Woodbridge: This is the holding company for Canada’s wealthiest family, the Thomsons, with a 2011 net worth of $21.3 billion. It is a Gang of Seven member because it owns the Globe and Mail. At one time, the Thomsons owned more Canadian newspapers than anyone else. The family withdrew from Canadian media, except for the Globe, to create a global information empire in legal, financial and health-care information. In 2008, Thomson Corp. merged with Reuters News Agency to become a giant in global news distribution. The Thomsons have owned the Globe since 1980, losing majority control in 2001 when the paper was merged with CTV. In 2010, Woodbridge regained an 85 percent share in the Globe, with BCE owning the remaining 15 percent. The Globe has been a conservative paper ever since Thomson jettisoned its liberal editors in the late 1980s and eliminated what it called “excess circulation” — papers bought by readers the Globe’s tony advertisers didn’t want to reach because those readers didn’t earn enough income. Torstar: This company perhaps should not be included in the Gang of Seven since it still espouses liberal principles in its reporting and commentary. Nonetheless it owns the Toronto Star, Canada’s largest paper, retaining its lead over the Globe and Mail only because it publishes seven days a week compared to the Globe’s six. Along with three others papers it owns in southern Ontario, Torstar controls 11.5 per cent of paid daily circulation, as well as the Metroland chain of community papers. There are several ways to win back some control from the Gang of Seven (or Six) and increase diversity in the news. Most important is to restore core CBC funding to its historical levels. The CBC has been a genuine alternative voice to corporate media, but it is being mortally wounded by dozens of small cuts over two decades, forcing it to the right to appease the unappeasable Tories. Just as important is to support the continuing growth of alternative online news sources and the Canadian media democracy movement, which has already enjoyed several high-profile victories in beating back the corporate media onslaught.